The Board of Women Visitors Records was transferred to the University Archives and Records Center on October 25, 2012 (Accession Number 2012: 059). The Board of Women Visitors was created in 1875 when the Board of Managers for the Hospital of the University of Pennsylvania appointed a Board of Lady Visitors to tend to the needs of the patients and assist with the various housekeeping chores. The responsibility of the Lady Visitors was to regularly inspect the wards of the hospital and make recommendations for patient care and comfort. In 1884 the name was changed to the Board of Women Visitors. One of their first notable efforts was the creation of the Training School for Nurses and the Nurses’ Home in 1886. During their inspections it was observed that the lack of trained nurses had an impact on the care of the patients. As such the Board recommended the hiring of a head nurse to begin a training program, for which they would pay her annual salary. As the Hospital of the University of Pennsylvania grew, so did the tasks undertaken by the Board of Women Visitors. The Board committees grew to include the Inspection Committees where a Board member represents each department and visits an assigned area on a regular basis; the Abrahamsohn Committee which has provided Christmas and Easter decorations to Hospital patients and staff since 1895; the Nearly New Shop Committee which oversees the volunteer run consignment shop; and the Women’s Committee of the University of Pennsylvania Medical Faculty (originally the Doctor’s Wives Service Committee) which organizes social and fundraising events. The Board was also responsible for opening the Social Services Department in 1908, the Occupational Therapy Department in 1923, and the Department of Volunteers in 1940 which oversees the numerous volunteers who work on the Hospital floors and in the Records Department. The Board also oversaw the Hospital’s Corner Cupboard Gift Shop, and started a beauty salon 1948. The creation of the Hospital Chapel between 1954 and 1963 was another of the Board’s efforts. The Board has also become a major fund raising arm to support the needs of the Hospital funding projects that are normally outside the Hospitals basic operating budget. The most notable and visible fund raising arm of the Board is the Philadelphia Antiques Show. 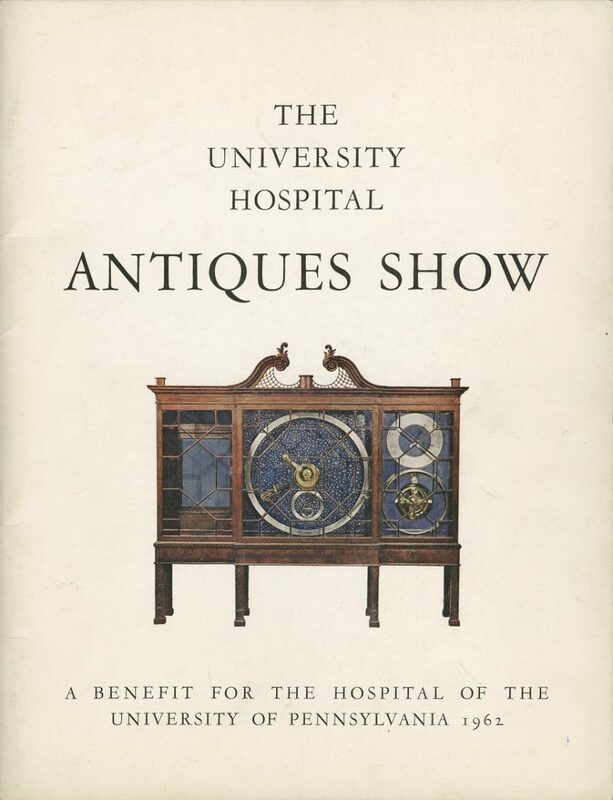 First held in 1962, the Antiques Show originated with Board member Alice B. Brown following a lunch she had with friends in Boston in 1960. The story of how their benefit antique show raised $15,000 inspired Brown to propose the idea to the Board of Women Visitors and the Board of Managers who approved of the idea. The success of the show has made it an annual event in Philadelphia, with the proceeds going to a specified recipient chosen by the Board of Women Visitors. Originally held at the 103rd Engineers Armory at 33rd and Market, the show has since been held at the Philadelphia Navy Yard and the Pennsylvania Convention Center. The Board also funds proposals outside of the Antiques Show, evaluating requests three times a year which includes new projects for the Hospital as well as contributions towards furnishings and equipment. The Board of Women Visitor Records document the activities of the organization to provide services and funding to the Hospital of the University of Pennsylvania. While the Board originated in the 1870s, the Records cover the work done during the mid to late twentieth century. These include annual reports, committee minutes, and funding proposals. The largest series in the collection focuses on the Philadelphia Antique Show – the Board’s largest annual fund raising effort, and its most visible program. The work of the Abrahamsohn Christmas and Easter Committee and the Women’s Committee of the University of Pennsylvania Medical Faculty can be found in UPC 503 and UPC 504 respectively. Abrahamsohn Christmas and Easter Committee. Wives Committee of University of Pennsylvania Medical Faculty. Nearly New Shop Sale Poster n.d.
Hospital Plaque Inventory (1) n.d.
Hospital Plaque Inventory (2) n.d.
Memorial Plaques Department Heads n.d.
Women’s History Month Honor n.d.